In june 9th the Iberocoop iniciative finished the worldwide contest The women you never met: in this editing challenge we made more than 1500 biographies of women in more than 10 different languages. On March 19 we gather in the Biblioteca de la Legislatura de la Provincia de Buenos Aires and made the first digitizing workshop of the year. During the event we worked with people who already had knowledge of digitalization and cataloging, it was extremely interesting the exchange between the assistants of the workshop: they discussed the criteria of digitization and the management of the files. After this meeting we received the approval of the authorities of the library to start uploading to Wikimedia Commons the memories of the foundation of the City of La Plata. The Parque de la Memoria donated to Wikimedia Commons 65 photographs of the permanent works of art they have, this donation is the product of a new alliance generated by the program to promote cultural institutions of Wikimedia Argentina. You can see the pictures donated here. The links to the University of the Basque Country are bearing fruit beyond academic curriculum. Following up from the last year experience with Lorea Agirrezabal as Wikipedian in Residence, this April Leire Cano, has taken the task to bridge the gap between Wikipedia and children's literature in Donostia-San Sebastián. The program, intended to encourage engagement with Wikipedia and expand knowledge of children's literature in collaboration with university, has met with a very positive reception by both participants and involved institutions. The job consists of wikifying children's literature stored in the Children Literature Documention Centre. This time the participant undergraduates of the College of Education get down to create articles related to well-known characters from children novels, as well as folk or author tales. They amount to 17 fiction characters distributed in 17 articles that will be composed by 34 students from instructor Ibon Egaña’s class, the children literature subject in the Education studies. In addition, this year an 3 hour edit-a-thon was staged on 3 March to visualize the program, reinforce in Wikipedia and encourage production; find further details here. The Wikipedian in residence Leire Cano assists in the above tasks under way, by coordinating and editing materials for Wikipedia publishing, as well as releasing image licenses and recording live writers introducing themselves, included in the Voice intro project, and reading excerpts from their own literary works. Up to date, two recordings have been completed, i.e. Pako Aristi and Juan Kruz Igerabide. As in 2016, also in 2017 we organised the Brussels writing weeks to get a better coverage of the city of Brussels and its region on Wikipedia. Earlier we noticed that other capitals from other countries are much better described than the Belgian capital, and to avoid a Belgium gap (like the gender gap) to grow any further, specific attention is needed for this area. In 2016 we organised various sessions in libraries, and this was the plan for the 2017 edition as well. As preparation for these sessions we organised a Wikipedia training for library staff, to get them familiar with Wikipedia and to give them an understanding what comes with writing an article in Wikipedia. The 2017 edition of the Brussels writing weeks started at 22 April and ended at 6 May 2017. During the first week we organised six walk-in sessions in libraries in Brussels and the Royal Flemish Theatre where interested people could walk in, ask questions, and work on articles. Two of these six sessions (in Royal Flemish Theatre with guided tour and Muntpunt) had the format of an edit-a-thon and with a special focus: dance. Brussels is considered to be the capital of the dance in the world with a rich culture, but this is terrible covered nor described on Wikipedia. A big gap for what extra focus is needed to have it not grown as large as the gender gap. The project was organised together with our partners Flemish Community Commission (VGC), Packed vzw (expert centre for digital cultural heritage) and Het Firmament (expert centre for performing arts). See also the project page on Wikipedia, project page edit-a-thons dance, project page WMBE wiki and the photo category on Commons. On 20 April Wikimedia Belgium together with Wikimedia Nederland supported in Antwerp a workshop about Wikimedia and the performing arts, under the flag of the Nederlandse Taalunie (Dutch Language Union). The goal of the Dutch Language Union is to enlarge the Dutch language visibility online and make cultural heritage more available and exchangeable. One of the main subjects the workshop focussed on were the performing arts. On 25 April 2017 we had our first Civic Lab Brussels meeting. Civic Lab Brussels is an action-oriented group for those interested in creating solutions for local communities, mainly through technology. During our biweekly open gatherings (all backgrounds welcome) we work on civic projects, get feedback from tech and government experts and learn about civic innovation and related concepts like open data, civic hacking and open government. Civic Lab Brussels is organised by Open Knowledge Belgium, Wikimedia Belgium and OpenStreetMap Belgium, and we try to promote open data, free knowledge, etc, following the Open Definition (Wikipedia). With the meetings we invite anyone interested from businesses, cultural institutions, governments, educational institutions, individuals and anyone else to join and share. See for more information and links at the WMBE wiki page, Launch of Civic Lab Brussels blogpost and the Meetups page for meetings. We meet every two weeks on Tuesday evening in BeCentral in Brussels above Brussels Central Station. On Tuesday 27 April 2017 we organised an edit-a-thon together with the Katholieke Universiteit Leuven (KU Leuven) in their University Library. First we gave an introduction in Wikipedia, Wikimedia and how to edit. Then the participants started to edit Wikipedia. 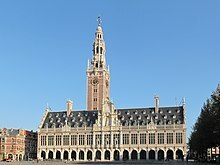 The focus of the edit-a-thon was on Leuven, the university and monuments. This month our newsletter is going to talk about March and April GLAM activities of the UG Wiki Educação Brasil. On the very beginning of March, we had an online 16WikiWomen, in response to the international call spread through Wikimedia-L, that resulted in 4 new articles. We had the first training session with Museum of Public Health “Emílio Ribas” Museum on Mar 14th, that was focused on creating accounts on Wikipedia with the museum staff and teaching them how to use their user page for tests. The next steps are to start working with articles and uploading images from the collection to Commons. During March, we also had a meeting with Diego Baravelli, a professional photographer and winner of the Wiki Loves the Olympics. Diego was interested to contribute to commons and our initiatives with his personal photos archive. Our group discussed a GLAM project including his personal archive, evaluating some pictures we noted a lot of aerial photos from Rio de Janeiro, exclusive photos not available on commons yet. Based on that photos, in partnership with Diego Baravelli, our group created the Rio From Above project, which aims to document the metropolitan area of Rio de Janeiro through images and aerial videos of the region. In this first stage, 65 images of Diego's personal collection were uploaded to the commons as a pilot project for proposal validation and included in various Wikipedia's articles. On March 21th the GLAM coordinator Juliana Monteiro had an informal meeting with the UK chapter, in London. The meeting with the British staff was an opportunity to know their office and the people behind the activities, like Lucy Crompton-Reid, Daria Cybulska, Robin Owain, Stuart Prior, Karla Marte and Richard Nevell. It was possible to talk about the GLAM experiences from both countries, since Brazi is still on its first steps towards openGLAM and Wiki projects with cultural institutions. The conversation was good to exchange tips, strategies and contacts with people from other places that could help UG Wiki Educação Brasil. In the end, Juliana Monteiro mentioned the desire of the UG in translating and localizing the UK publications about GLAM experiences, in order to improve the training sessions back in Brazil, to what the Wikimedia UK agreed. During the end of March and the first week of April, Juliana Monteiro and Rodrigo Padula participated of the Wikimedia Conference. The conference was a great opportunity of exchanging experiences about the Wikimedia movement, meeting new people and getting in contact with new initiatives from all over the world, many with interest of becoming future partners of Brazil. The Wiki Education Brasil was invited by Wikimedia DE to give a talk about "How to grow a user group" where all projects developed during the last months were presented and discussed including all GLAM initiatives, like the one with Immigration Museum, and projects under planning, like the one with the Museum of Public Health “Emilio Ribas”, both in São Paulo city. One of the immediate outcomes of the GLAM coordinator´s participation on the Conference is the beginning of the translation and localization of “How to work successfully with Wikipedia: a guide to galleries, archives, libraries and museums” by the Brazilian UG Wiki Educação Brasil staff and volunteers. The idea is to involve the chapters from other countries of Latin America, like Chile and Mexico, in order to have the content translated to Spanish and to have case studies from these countries within the publication. The first contact has been already made with chapters and now the Brazilian UG waits for their feedback on the idea. The UG was able to finish the translation of “Wikimedia Commons: The free media archive”, asked by the German chapter. This translation was made possible by the efforts of the UG staff along with the help of offline volunteers, as the librarian Diego Costa and the museologist Éricka Madeira. The plans now are to review the final text and start the editing/diagraming process. On April 13th, we had a meeting with the Immigration Museum of São Paulo, the first GLAM partner of the UG. We are planning together an edit-a-thon about immigration in Brazil as part of the museum´s special agenda for the National Museum Week on May. We also had the chance to discuss other ideas to reinforce the partnership with the museum on the next months. We also reached the final stage of a data organisation process that will allow us to input manually structured information about approximatively 300 museums localised on São Paulo State on Wikidata from May onwards. Since April 18th , Juliana Monteiro is taking part of the UNESCO Challenge, that will happen until May 18th. She has been working to improve entries on Wikidata and to translate articles about historical sites of Africa and Latin America to Portuguese and has reached 32 points so far. On the end of April, the UG released the pilot project Women in Culture, which aims are helping existing projects concerned with decreasing the gender gap within Wikipedia and to create/improve content about Brazilian women on the encyclopaedia and its sister projects. Since 2011 Denmark's National Gallery has invited GLAM institutions to share their learnings on open GLAM data inviting to an annual conference Sharing is Caring. Anchorwoman is and has been Merete Sanderhoff. She is specially apt for that position as the SMK Museum has under her lead strongly favored a open license policy motivating other GLAM to follow her example. She now forwarded the idea to Hamburg and the Museum für Kunst und Gewerbe (MKG). This museum has become a pathmaker for open licenses in the GLAM realm in Germany. And is one of the proofs for how important it is to Wikimedia to be part of a larger movement and a continuous discourse on open GLAM. The MKG has been present as speaker on the GLAM conference Zugang gestalten empowered by WMDE since 2011. The MKG has contributed to the art hackathon Coding da Vinci held by WMDE and partners in Hamburg last year. And was now hosting together with WMDE and Hamburgs University the first extension of "Sharing is Caring". Read for detailed information our blogpost in German. Wikimedia helped to diversify the programme with contributions by Karin Glasemann from the Swedish Nationalmuseum and Antje Theise from Hamburger Statelibrary both reporting on their experience collaborating with Wikimedia volunteers applying open licenses. And once again about a dozen GLAM institutions participated in the WMDE workshop "©© change your mind". Presented more in detail last month in This month in GLAM. In June volunteers from Kontor Hamburg will run a GLAM on Tour Station at the MKG called Wiki Loves Music. In the debates following the extensive and intensive programme of the conference all participants agreed it needs two thing for open GLAM: alter the spirits within the institutions and patience. I think we may all agree. GLAM on Tour Stations in Cologne, Hamburg and Wuppertal. Come and join us. On April 11th 2017 Ghana launched its first ever GLAM project. The project which is dubbed GLAM Ghana, will focus on digitizing the holdings of the Public Records and Archives Administration department (PRAAD) and release these content with open licenses to allow use on Wikipedia and other sister projects. The idea of this project was first borne out of a publication by the archival institution calling for help to save the further deterioration of their holdings. This urgent call graced us the opportunity to help and also share with the world what they had. PRAAD is the sole archival institution that holds records of our history and other relevant governmental documents. This partnership was secured through Open Foundation West Africa (OFWA) and coordinated by Felix Nartey and Raphael Berchie. The project is fully funded by the Wikimedia Foundation and is a pilot phase which will last for 6 months. It will employ a WIR and a Coordinator to ensure a better coordination between staff of the institution and the work of the WIR. One of the highlights of this partnership is building the capacity of the institution to take on a process like this in our absence and to assist them to create an online a digital repository to enable them solve their current problem and to establish their presence. On 27th and 28h of April Paolo Brambilla attended to the conference Open Data for Cultural Heritage in Milan and had a follow presentation "Il progetto Connected Open Heritage: la preservazione digitale del patrimonio culturale in pericolo nei progetti Wikimedia". After a year, the 16900 photographs of the Paolo Monti Archive by BEIC uploaded in April 2016 are now used in 1300 Wikipedia articles, in 100+ different languages. During the last month, the Wikipedian in residence at BEIC added 1200+ coordinates to the images of the historical archive, thus reaching 38% of georeferencing. You can browse them on a prototype using OpenStreetMap. ↑ See details in the monthly report (in Italian). The 12 Peaks mountaineering challenge is a campaign initiated by our long-time contributor Mario Šarevski and organised by the mountaineering association "Transverzalec" with the goal of climbing 12 "unknown and least visited" peaks on the territory of Macedonia. The campaign consists of one-day tours to peaks on different mountains in the country, which are conducted once per month in the period from October 2016 to September 2017. In the first months of the challenge, the tour to the peak Lisec (1,935 m) on Golešnica in October was integrated to the Geoexpeditions project in 2016; in February 2017, Kiril Simeonovski joined Mario in the challenge and they have both started actively promoting the Wikimedia projects to the other participants. For that purpose, we have created an instructional leaflet on uploading images to Wikimedia Commons and delivered a mass of it during the tours conducted to the peaks Movnatec (1,564 m) on Dautica in March and Liska (1,908 m) on Ilinska Mointain in April 2017. The promotionial activity has eventually paid off when new users' uploads of images from the visited places during the tours were noticed on Wikimedia Commons, especially those of the mountaineer and photographer Bojan Stojčevski after the end of the seventh tour of the campaign in April 2017. The West Bengal Wikimedians have organised a photo walk to document the Dutch cemetery in Chinsurah, a Dutch colony between the 17th and 19th centuries. During the photo walk, they took 93 photos of the cemetery. At the same time, they created Wikidata items for the people buried there and geotagged a number of the graves. To top it off, they created a SPARQL query for Wikidata to show the results on a map. More details are available on the project page. The Midden-Brabant public library held a photohunt in Spoorzone in Tilburg on 1 April to take pictures of local heritage for Wikimedia Commons. Uploads can be seen here and here. Eight users, of which 7 newly registered, uploaded 250 photos in total. This activity is part of the Wikipedia and Public Libraries program of WMNL. UNESCO's Memory of the World-register contains documentary heritage that is of exceptional importance to the world. This register currently has some 300 entries, among which 11 from the Netherlands. The most well-known are Anne Frank's diary and the archives of the VOC and the WIC. The Dutch MoW committee aims to make this important heritage more visible and usable, both nationally and internationally. Wikipedia is considered to be an important and favourable platform for this. To help the Dutch MoW institutions find their ways around Wikipedia, Wikimedia Commons and Wikidata, User:Spinster (Sandra Fauconnier) has been appointed as Wikipedian in Residence (WiR) for the period May–July 2017. The project kick-off took place on April 11th at the headquarters of Wikimedia Nederland in Utrecht. This project was directly inspired by the positive results of the Wikipedian in Residence project the Dutch national library (KB) and national archive (NA) ran in 2013-14. For this reason the KB is involved in the MoW project in an advisory role. The national library of the Netherlands (KB) donated 2608 public domain images from 187 historic children's picture books (period 1810-1880) to Wikimedia Commons. The images are taken from the Memory of the Netherlands, to which the KB and the public libraries of Rotterdam, Amsterdam and Deventer have contributed. On the occasion of the 16th Conference on Popular Music held in Oiartzun, Miguel Ángel García and Jorge Galván, members of Wikimedia Spain, participated with a talk on the experience of inclusion of the music library from the Joaquín Díaz Foundation in Wikimedia Commons. The event took place in Soinuenea, a museum and documentation center on folk music, whose funds are composed by musical instruments (more than 1400 units of the Basque Country and the rest of the world), library (more than 5800 books) and music library (more than 4800 units on disc, cassette and CD). Other talks focused on EMSIME, Document Management System for the Heritage of the Museums of the General Inventory of the Basque Country, by Rosa Ramírez; Ondarebideak, application for the management of Cultural Heritage, by Maddalen López la Calle; MIMO: an on-line database of musical instruments in public collections, by Manel Barcons Carbonell; the Archive of Oral Heritage of the Museo do Pobo Galego, by M. Concepción Losada Vázquez y Sergio de la Ossa; the experience of the Archive of Traditional Asturian Music, by Alfonso Fernández; Availability and ownership of multimedia information on cultural heritage in legislation, by Isabel Hernando Collazos; and Internet as a window for preserving and showing the cultural heritage, by Gerrit van der Veer. Award ceremony at the spring conference for Swedish Museums on 25 April. Video about the GLAM-EduWiki collaboration Välkommen till min plats. The Wikipedia Education Program in Sweden has joined forces with GLAMs to lead the way for local collaborations where schools access collections and literature to share on Wikimedia projects. The efforts have been recognised nationally via the Pedagogy Award of the Year, presented at the spring conference for Swedish Museums on 25 April. The award winning collaboration is the GLAM-WikiEdu project Välkommen till min plats (This is my area), also known in English as “WikiWelcome”. Wikimedia Sverige (WMSE) partnered with Stockholm digital archives for schools and the Swedish National Heritage Board to start the project in 2016. 250 students, in primary and secondary education, and 10 teachers in Stockholm joined the pilot. Students researched their local history with support from local GLAMs for eventual sharing on Wikipedia and other open sites. The writing competition UNESCO Challenge started April 18, with focus on articles about cultural heritage in danger. Wikimedians can translate, improve and write new articles, add images and edit items in Wikidata to participate, and the contest is open until May 18. So far 85 participants have signed up, and have edited 896 articles and items. A million bytes was added already the first week. Feel free to join in or encourage others to participate, and don't forget the bonus points available for getting an experienced user to join now. The amount of cultural heritage data on Wikidata is steadily increasing as we continue to work on processing and migrating the Wiki Loves Monuments database. We have passed the 50% mark on the Swedish archaeological monuments upload, which is by far the largest dataset in our collection. Over 80,000 Wikidata items have been edited and you can keep track of the progress via this SPARQL query. Some of the participants at the workshop we organized in Uganda, 26 April 2017. In late April and early May WMSE participated in a couple of events in Uganda and Kenya. The events focused on protecting more cultural heritage sites in the countries and increasing awareness about them. WMSE contributed with information how the groups could utilize the Wikimedia platforms to reach more people with the information. Furthermore, a number of meetings with representatives from national cultural heritage organizations followed and we discussed approaches to making more information available digitally. In the coming weeks we will work to develop a Memorandum of Understanding with the National Museum of Uganda and one with the National Museum of Kenya for future efforts to bring the countries cultural heritage online. There were also discussions about how to form local Wikimedia User Groups and what type of activities that could entail. These activities and the new partnerships will inform our planing for Connected Open Heritage 2. Andy Mabbett has started as Wikimedian in Residence with The Physiological Society (see en:Wikipedia:GLAM/PhySoc) and, separately, with The History of Modern Biomedicine Research Group (see en:Wikipedia:GLAM/HMBRG and the Group's announcement). Both roles are part time. Among Andy's first actions in each case has been to develop lists of red links for notable people, and you are invited to turn them blue by writing (or in a couple of cases translating) articles. On April 7, Wikimedia DC worked with the Library of Congress on the Congressional Committees and Hearings Wikipedia Edit-a-thon. Deputy Librarian of Congress Robert Newlen gave the opening address for Dr. Carla Hayden  to kick of the whole day event. A number of historians and scholars gave presentations to contextualize the study of Congress, and Sara Snyder from the Smithsonian gave a Wikipedia tutorial to the few dozen attendees and remote participants. After lunch, folks from the Library and from NGO's in DC helped edit articles related to Congressional committees. Using the Program and Events Dashboard to track activity showed  more than 7,000 words added across 58 articles. Andrew Lih gave a closing address, giving a short overview of Wikidata and the possibilities for the Library of Congress when using linked open data in the future. A quick perusal of the Wikidata entires regarding U.S. Congressional committees and subcommittees shows they are very rudimentary and incomplete, which merits more in-depth modeling. On April 10, WMF executive director Katherine Maher and Wikimedia DC's Andrew Lih met with the new administrations of the Library of Congress under Dr. Carla Hayden, and the Smithsonian Institution under Dr. David Skorton. At the Library of Congress, Maher and Lih met with Hayden's chief of staff and heads of communication and preservation. There was interest in Wikisource, as the Library does not have their own citizen transcription effort, and also in engaging with the MediaWiki technology community. They were encouraged to investigate coming to Wikimania, Hackathons or the new iteration of the Wikimedia Developers Conference. The Library of Congress was also interested in how to work more with their oral history project and how it might fit into Wikimedia content. Maher met also with David Ferriero, Archivist of the United States at the National Archives, who was also the keynote speaker at Wikimania 2012, making the rounds for all the "Big Three" institutions in Washington D.C.
Save the date to join Wikipedia and Wikimedia enthusiasts on August 9-10 for the annual continental conference, before Wikimania 2017, August 11-13. Wikipedia + Libraries: Better Together is an OCLC project that is building bridges between public libraries and Wikipedia. April saw the kick-off of the Librarians Who Wikipedia series of interviews with library staff who engage with Wikipedia. In the first article, OCLC WIR Monika Sengul-Jones interviews Mary Phillips, of Carnegie Library of Pittsburgh, about how Wikipedia editing was an opportunity to strengthen GLAM-related institutional partnerships, access the article here. A complementary article, "Extending the Reach of Public Libraries," compiles examples of ways that patrons can engage with public library materials, resources, and community spaces at Wikipedia editing events. Also featured in April are highlights of the #1lib1ref campaign. Sengul-Jones is currently recruiting librarians who Wikipedia to be interviewees for the series. Two more articles will be published in May. The contours of the project were announced on the April WALRUS call. Several Wikimedians volunteered to be training program advisers. GLAM Wikipedians interested in sharing their editing and outreach expertise by helping to shepherd the cohort of public library staff through the training program this fall can reach out to Sengul-Jones to discuss opportunities. In this issue we highlight the #1Lib1Ref campaign, the 2017 Wikimedia Conference, developments to the Wikipedia Library Card Platform, a new User Group for Wikipedia & Libraries and, as always, a roundup of news and community items related to libraries and digital knowledge. Year two of #1lib1ref was three times as large as last year! It ran in over 18 languages, with 4,171 hashtagged edits from 741 contributors to 2,588 pages. The longer campaign this year – 3 weeks in total – saw an increase in the number of workshops at libraries around the world. Looking forward to seeing even greater success in 2018 – if you are interested in supporting it in your language or context, make sure to join the Wikipedia + Libraries Facebook group, now up to 468 members! The three-week approach appears to have strengthened the scalability of the campaign – allowing more time for folks to participate, without a decline in the amount of social media energy – and we actually saw increased energy towards the end of the campaign, as folks hosted events after learning about the campaign during the first week. We believe the three-week format, paired with the Coffee-Hour kit, allowed for more librarian-to-librarian exchange events – which provides more precedent and experience among librarians for other kinds of campaigns. Participants continued to use the #hashtag in their edit summaries, but some found a new trick. With two hashtags, like #1lib1ref and #UNClib, they were able to track both their general contributions to the campaign and their group's specific achievements – in this case the University of North Carolina Library. This paired extremely well with another new and exciting development: goals and pledges. Several groups set ambitious targets for their institution or themselves, and by using two hashtags (one for the campaign and one for their group), they were able to easily track their specific impact within the broader campaign. In a show of phenomenal teamwork and dedication, at the State Library of Queensland the library staff dared themselves to add 1000 citations for the campaign. And they did! One of the most historic and tense sports rivalries in United States history, the basketball feud between University of North Carolina and Duke University, spilled over onto the #1lib1ref court. The hashtag #UNCvsDuke showed off another idea for encouraging participation through friendly competition. We love all 1lib1ref participants, but we have to say that this year UNC trounced Duke in added citations and Duke humbly acknowledged their loss. Congrats to both and good luck next year! The campaign's top Tweet encapsulates the most compelling message for participants: "Librarians all over the world are giving Wikipedia the gift of a citation. Because #factsmatter." Recent political developments and the public climate of questioning the reliability of sources of information (see fake news) helped the campaign maintain momentum relevance and momentum. The idea that Wikipedia is not only becoming more complete but also more factual and more reliable makes for a powerful story in times of information uncertainty. This is an area where Wikipedia can transform doubts about its credibility to a surprising faith in its neutrality and standards for citation. #1lib1ref is the perfect vehicle for sharing that broader message. In Greece, targeted outreach events allowed for training librarians at a Library Science program (future Wikimedians! ): read the report. Though raw numbers of impact in languages other than English were not massive (and a couple of coordinators expressed disappointment at the spread of the campaign on Twitter and measurable hashtagged edits), almost every community found the communications effort valuable: the simple and focused message of the campaign allowed for lower energy targeted outreach. When talking with GLAM-Wiki coordinators at chapters who participated in #1lib1ref this year at the European GLAM Coordinators meeting, each organization found it a valuable tool for engaging organizations they hadn't engaged recently. Though this year's campaign greatly expanded and diversified the impact, to provide a broader conversation about the role of Wikimedia citations in the library-verse, at times there wasn't sufficient staff and peer-to-peer support among folks hoping to bolster #1lib1ref in their particular context. Next year, we hope to engage a broader organizing community through the soon to be affiliate, the User Group (more on that below!). We also found the Wikipedia + Libraries Facebook group (which formed shortly before the campaign) enabled more of peer-to-peer support that was missing from a Twitter-centric campaign. By investing energy developing both these communities, we hope to have better infrastructure for the decentralized network to learn from itself, while also providing targeted WMF support to community leaders that allows for consistent and steady messaging and endorsement of their efforts. The Wikipedia Library team has been supporting the formation of an independent Wikipedia Library User Group, to help expand the impact of broader library-focused outreach in the Wikimedia community. The user group interest page can be found on Meta. At the time of writing, nearly 100 community members had already signed interest for the group. No formal application has been made to AffCom just yet, but this show of support is a fantastic start. After official recognition, the next step will be forming a 'steering committee' to kick off activities and organize the first year's efforts. We hope that the group provides a more community oriented forum for hosting #1lib1ref, developing the global story and collaboration about the importance of Wikimedia projects in the library space, and facilitates other unidentified opportunities for broad collaboration between librarians and the Wikimedia community. Moreover, we hope the user group provides a platform for library needs from the Wikimedia community to be expressed across the movement. Share the group with your library advocates and sign up! This user group is not run by WMF Programs, although we hope to facilitate its development with service and support. The libraries + Wikipedia movement is too big, broad, diverse, global and powerful to be constrained in its potential – leadership needs to emerge from many quarters to thrive. Proposals for discussions at the 2017 Wikimedia Conference, included one on Wikipedia + Libraries. Librarians are “offline Wikipedians” who already have the skills to make them successful Wikimedians. It is our job to give them the confidence to succeed. Libraries hold important resources that will help make articles stronger and more credible, yet Wikipedians are unaware. By 2030, these gaps will have been closed by actions that will bring librarians and Wikipedians closer together. This discussion fed into broader proposals for thematic statements (the eventual outcome of the movement strategy track), where statements such as "By 2030, Wikimedia should lead an ecosystem of key players in the knowledge commons movement to improve quantity, quality, and reach of free content, to extend the credibility of the knowledge commons and to increase its resilience without compromising our independence or values" were directly influenced. The Wikimedia Conference was also a good opportunity for a Wikimedia + Libraries meetup, where interested participants discussed their successes and challenges over the past year, plans and opportunities for the coming year, and the upcoming user group. The conversation highlighted the need for a user group where such discussions can happen more regularly, where participants can support and provide advice to each other, and where broader initiatives can be communally supported. This post is excerpted from the Wikimedia Blog. While an enormous amount of content is available through The Wikipedia Library, our current distribution and access processes leave a lot of room for improvement. Signing up for partners is currently done individually and on a per-partner basis, resulting in a slow turnaround on approval and distribution of access, taking on average three weeks from application to access, which is far too long. We've been limited in the number of accounts we can give out for most publishers and accounts are generally granted for exactly one year at a time, whether editors need longer perpetual access, or worse if they only want to grab a couple of references. Lastly, there hasn't been a way to search through the vast content across all our separate partners. At the center of our plans for increasing and improving access is the Wikipedia Library Card platform. We rolled out phase one last quarter, addressing the slow signup and approval challenges while beta testing and improving it with our latest new partners. Already delivering access, it should improve signup speed from three weeks on average to closer to one week, won't require editors to provide all their details every time they sign up for a new resource, and will be translated into as many languages as possible. By the end of March, we plan to move all partner signups over to the platform. Our next step (phase two), is to integrate a proxy authentication method, which will allow users to use their single Wikipedia login for direct access to partners who can accept authentication through the Library Card. This will greatly improve the ease of access for editors, should reduce the workload for us and our partners, and will hopefully translate to increased usage and citation of available resources. We are aiming to have this ready in approximately 6 months. An addition to our signup model, currently dependent on per-user approvals by volunteer coordinators, will be the Wikipedia Library Bundle. It would give any editor who meets account age, edit count, and recent activity criteria automatic access through the platform to a certain set of TWL partners, effectively replacing the account coordinator approval step, and covering approximately 25,000 editors across all language Wikipedias. The Library Bundle will provide immediate access to participating partner resources for eligible Wikipedians, without having to sign up and with no need to worry about only using their access for a handful of sources at a time. We're really excited about the opportunities and accessibility this access method will provide. Phase three of the Library Card Platform will seek to solve the issue of editors needing to browse partner-by-partner for needed resources. We will be implementing an integrated search tool which will index partner resources and provide search via a single interface. Not only will editors not need to log in separately to each of TWL's partners' websites, they will be able to search all their content from one place too. Five years ago, the development of Wikidata started! Data donation: Songkick have donated a datafile with 155K of their Songkick artist ID (P3478). ~55K are already matched, and the rest are in Mix'n'Match, awaiting your kind attention. can you face the #100wikidays challenge on Wikidata? It's aptly named #100wikidatadays. It is a personal challenge in which a person very significantly improves (at least) one Wikidata items per day, for 100 days in a row. There was already a version of the challenge on various Wikipedias, on Commons and on Wikisource - now on Wikidata as well. Participate and make Wikidata shine! You can see all open Phabricator tickets related to Wikidata here. This month, as part of the work with the Structured Data on Commons project, Alex attended DPLAFest 2017. At the event, he made sure to connect with and learn from and connect with various partner organizations in the network around DPLA, including Haithi Trust, METRO (which had a Wikipedian in Residence from 2013-15, Internet Archive, California Digital Library, and others in the greater DPLA community. The existing platforms, like DSPACE and others, don't have robust built-in authority control/linked open data use in ways that would make matching and reuse for DPLA and other organizations, like the Wikimedia community has. That authority control creation is still a really messy process -- especially for topics that have only regional interest-- with lots of time consuming back-end issues, some of them related to the bureaucracy of the library/metadata profession and institutional resourcing. That there are tons of opportunities for using Wikidata to enrich collections and metadata at the aggregation level; we really need to test them though, and many bigger organizations are at the stage where they see the opportunity but haven't done much testing. At the conference, I also gave a two hour workshop for Wikidata for Cultural Professionals: it was well received but a lot of information. You can find the slide deck on Google Drive and on Commons.